Across the globe, Italy is known as the premier location for hunting and foraging truffles, which grow only a few months each year. As we approach the heart of white truffle season, discover what you need to know about the prized tuber, from forest to table. While all truffles are deeply valued, the white truffle from Alba (tuber magnatum) is the most desired of all. Available only from September to December, this variety grows wild in the forests around Alba, a small Piemontese township. It is sought after for its larger size (as big as 9 centimeters in diameter! ), limited quantity, and quality of taste. 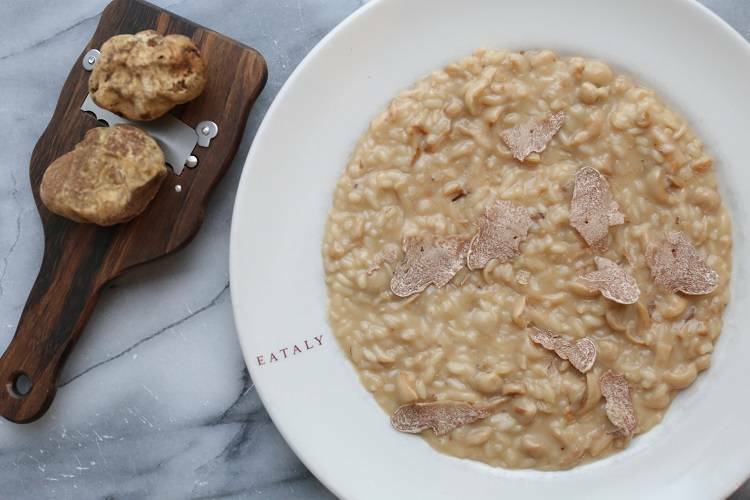 Every fall, Alba is enveloped in white truffles as citizens — along with the rest of the culinary world — eagerly await the daily arrivals. The golden, spongy tuber boasts pleasantly pungent aromas that give way to deep, earthy flavors from its cream-colored center. We love to shave the truffle in paper-thin slices over a variety of dishes, from pasta and risotto to eggs and meat. But before reaching the table, the white truffle goes on a journey that begins in the forests of Langhe, a fertile area in Piemonte perfectly situated between the Tanaro and Po Rivers and the Alps and Appenine mountain ranges. Le Langhe comprises rolling hills filled with vineyards and hilltop towns known for producing great wines, cheeses, and — of course — truffles. The soil is primarily clay and marl, allowing the truffle to grow larger around the roots of oak, poplar, and linden trees. 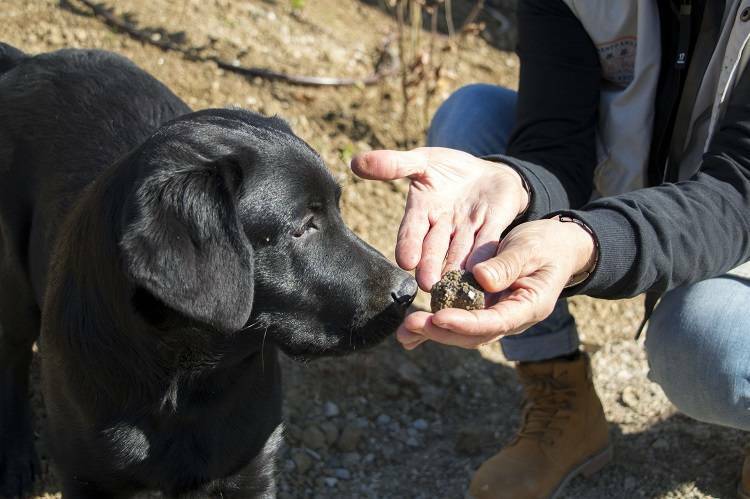 Each is individually sniffed out by a dog, which a professional truffle hunter has trained since puppyhood to detect the unique scent. (Truffles were once hunted by pigs, until we realized that pigs loved them as much as we do.) Once the dog reveals the location, the hunter digs out the truffle, gently cleans it, and finally shares it with the lucky recipient. 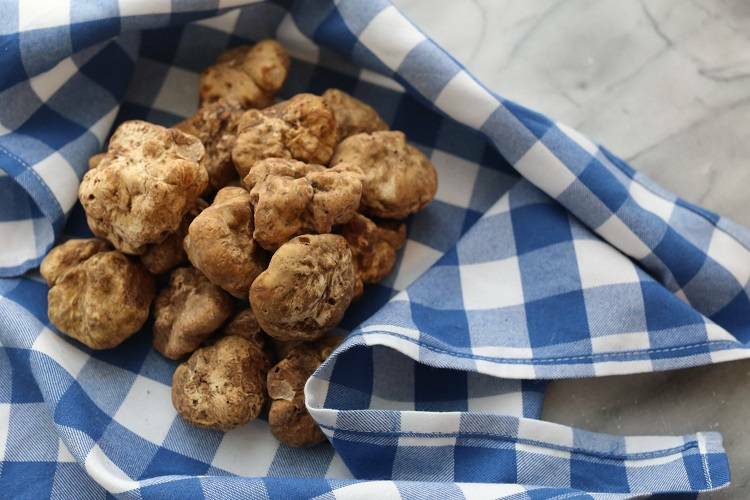 At Eataly, we receive our precious shipment of fresh truffles from Urbani Truffles, an esteemed Italian distributor that is responsible for more than 70% of truffle sales in Europe. Led by brothers Bruno and Paolo Urbani, the company sources fresh truffles directly from regional truffle hunters in Italy before sending them our way.